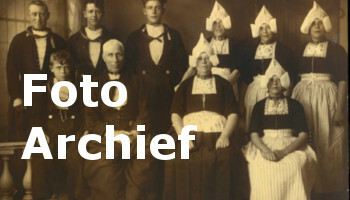 At Photographer Zwarthoed people from all over the world come and go. The atmosphere is casual and cozy. We are a real Volendam photographer with professional and friendly photographers. So no glorified gift shop with a decor in back of the store. We would like to show you a little how it works at Zwarthoed. You will be welcomed by our team and get an explanation and a short tour of our photo studio. 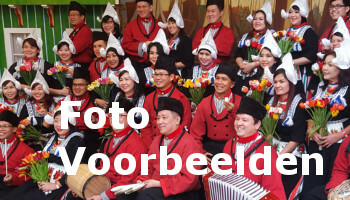 After you hear about the options, choose which photos you want to have and you can go change clothes in to a real authentic Volendam costume. If you have chosen a particular picture or photo series, the clothing and accessories will be chosen for you by our team. Our costume is original and groomed to perfection. We adhere to hygiene so with us everything is always clean and fresh. You pull on the costume over your clothes, so you're done in a second. Then you go into the studio where wooden clogs are fitted and wait for the rest of the members of your group. Our studio is very spacious and has three traditional backgrounds for photos. You can choose from a traditional pose for our traditional kitchen with fireplace. Or the old harbor as a background, with wooden masts and attributes of that time. Or you choose a scene at the outer door of a traditional Volendam house. You will be helped with the composition and our professional photographers make sure that the end result is fantastic. Shoot the pictures and you are good to go! The photo is taken several times so you always get the best possible picture. Especially whith groups we make sure that everyone looks good and nice. After shooting, you can change clothes again and you can wait until the photos are ready. Before your tea or coffee is finished the pictures will be ready! So ready while you wait!